Just recently my daughter-in-law invited me for a meal and made the most delicious pudding. Two years ago I made something similar for you and it proved to be very popular so she suggested that I should give you her recipe and I think you will enjoy it. 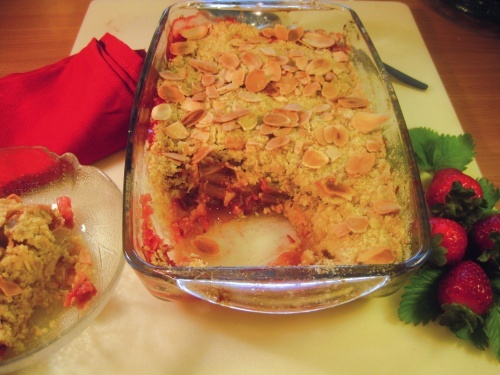 The crumble contains demerara sugar and has a sprinkling of almonds which gives it the lovely cunch. You will need an ovenproof dish of about 1 litre capacity. The one used measured 25 X 15cm (10 X 6ins). Prepare the filling: Wash and slice the rhubarb into 1in pieces. Hull the strawberries and cut in halves if large. In a pan mix together rhubarb, strawberries, water and sugar. Bring to the boil, put on the lid and simmer gently for 5 minutes. Heat the oven to Gas 5 / 190C. Crumble: Rub the butter into the flour and mix in the sugar. Strain the fruit. (the liquid makes a delicious drink). Put the fruit in the dish and spread the crumble over. Bake for 15 minutes then sprinkle on the almonds and a tablespoon of sugar. Bake for a further fifteen minutes or until the fruit is soft (test with a pointed knife) and the crumble is golden. This is lovely eaten warm and also cold. Serve with Greek yoghurt or cream.